It may be one of the smallest salons on earth, but Barry Nadeau makes his customers feel like queen for a day. The Gallery Building on North Palm Canyon Drive has seen more than a few transformations since it served as the El Mirador Hotel’s garage. The chauffeurs who once bunked upstairs are gone, as are the gas station and the art gallery, to say nothing of the glamorous hotel across the street, long since made over into Desert Regional Medical Center. 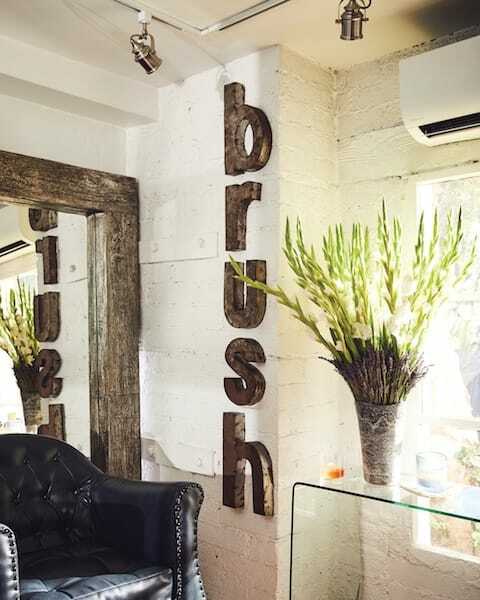 The most famous celebrity resident these days is brush Palm Springs Luxury Hair Salon, which moved into the space two years ago, bringing with it a sense of glamour and exclusivity. 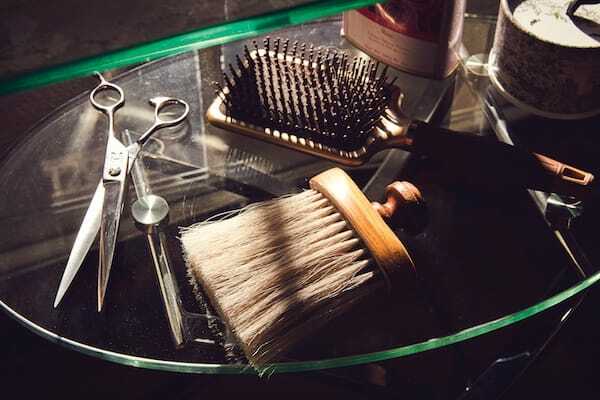 A snipping establishment strikes me as a fitting incarnation for this spot, but it turns out hair isn’t the only thing being made over here: Owner and stylist Barry Nadeau is reimagining the very idea of a hair salon. Instead of rows of stylists presiding over a cacophony of hair dryers, Nadeau envisioned a serene one-chair salon, a sanctuary where every client would receive the sort of personalized one-on-one attention a celebrity enjoys. To this end, brush is a light-filled atelier with views of palm trees and the San Jacinto Mountains; jazzy piano tinkles in the background; a beverage cart stands by the door stocked with premium drinks and cocktail fixings; and a faux-fur throw is ready to be draped over his guest’s lap. My own star turn began — after perusing of a dizzying proffered drink list — with questions about my hair routine. How many times a week do I wash my hair? Do I blow it dry? What products do I use? What didn’t thrill me about my current cut? Which is to say: It began like any consultation. I realized during this chat that Nadeau had positioned himself against the glass front of the building so the mountain view behind him couldn’t be missed, and it was clear to me the next hour would be nothing like any previous haircut. It wasn’t about staging per se, it was about thought: Barry Nadeau is a man who pays attention to the smallest details. Nadeau brings an impressive resume to brush. He trained with Vidal Sassoon, worked on celebrated heads of hair (and in some cases celebrated heads of state), and styled editorial for top fashion magazines. So when he suggests that my hair is in need of “movement,” I pay close attention. I have a lot of straight, coarse hair that’s survived any number of poor choices, so I agreed to “movement” with as much alacrity as if I’d been offered eternal youth. The absence of an atmosphere free from the acrid scent of acrylic nails was enough already to convince me Nadeau was on to something inside his tiny salon. 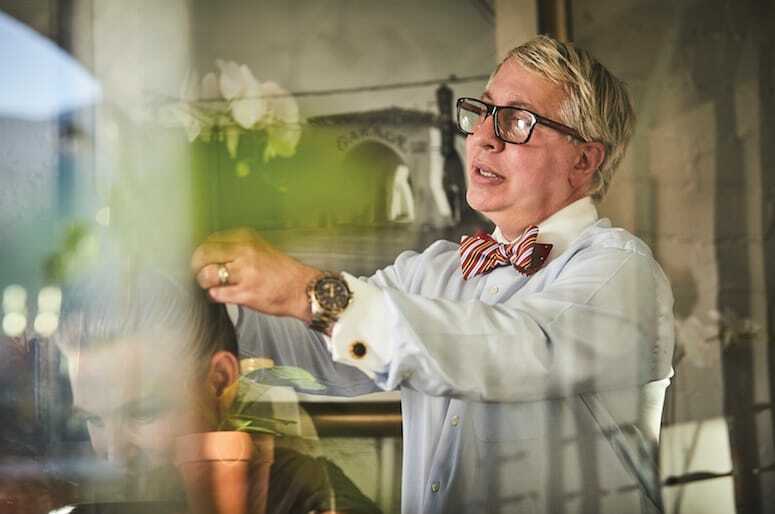 Mr. Barry Nadeau, creator, proprietor and hairstylist extraordinaire at brush, Palm Springs. The star treatment was lovely, but the reason to walk into brush in the first place — the haircut — turned out to be excellent. The unorthodoxy continued with a dry haircut. Nadeau chose this method because he said wet hair is “like a noodle” and he has no idea about the shape of hair when it’s wet. I must admit that I’ve always wondered how stylists know what wet hair will look like when it’s dry and how they’re sure what is done when wet will produce the desired effect. I’ve always hoped my various stylists didn’t harbor the same concerns only to shove the thought to the back of their minds once they pulled out the scissors. I appreciated Nadeau’s like-mindedness, even if the method left me clueless as to how the cut would proceed. Nadeau was endlessly accommodating and kept up a delightful patter as he worked. As he cut, brushing my hair forward and back, and in any number of ways differently than I’ve experienced before, we chatted about Coco Chanel’s cropped do, the Brontë sisters’ novels, and how thankful Barry is to everyone in the desert for making brush a success (he’s booked out three months in advance). We’d only known each other for half an hour, but I felt comfortable in his hands, enough to report that I don’t really care for the Brontës, that I’m a Jane Austen girl. No offense was taken and no jugular was threatened. Barry Nadeau ministrating the bright waiting area. With the cut done, we moved on to the wash, where I discovered the source of the earthy, clean scent that wafts through the salon: Davines hair care products, which Nadeau uses extensively on his clients and offers for sale in the shop and online. 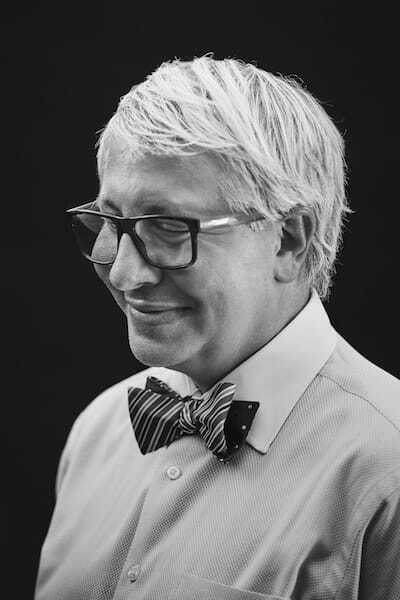 Nadeau brought Davines to the desert for the quality of its products, its commitment to the smallest carbon footprint possible, and the company’s worldwide outreach. In this case, that outreach means you leave with a memory draped in eucalyptus and rosemary. “I want to give people more than they expect,” said Nadeau. He covered my eyes with a scented, misted towel and then massaged my scalp. Before the blow-dry, the massage continued down the neck and shoulders and any expectations I may have had were long exceeded. It was wonderful, being pampered in this calm, beautiful space, being offered drinks and cuddling with a fur blanket. But at that point I still didn’t quite have a sense of what my hair looked like. 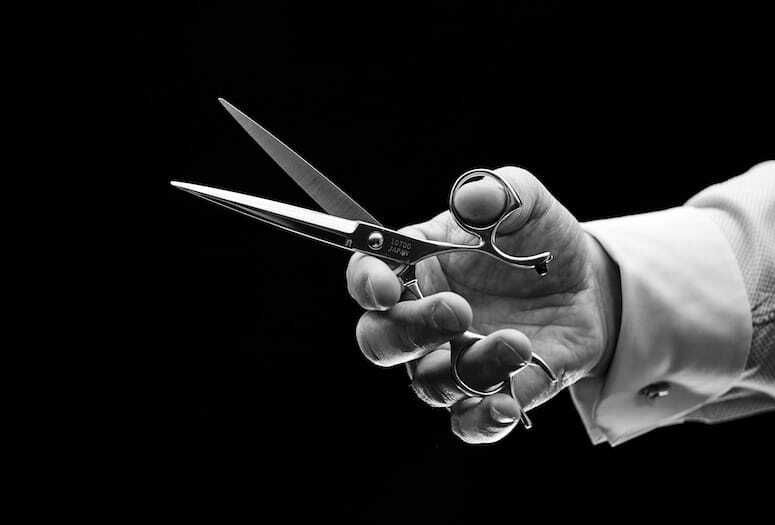 I saw hair fall to the salon floor, I heard scissors glide and snip, but the shape of things was still a mystery to me. Nadeau whirled a round brush and dryer around my head and mused about what the Gallery Building would be 50 years from now, what it might transform into next, and if people would remember the great little one-chair hair salon with the view of palm trees and mountains. 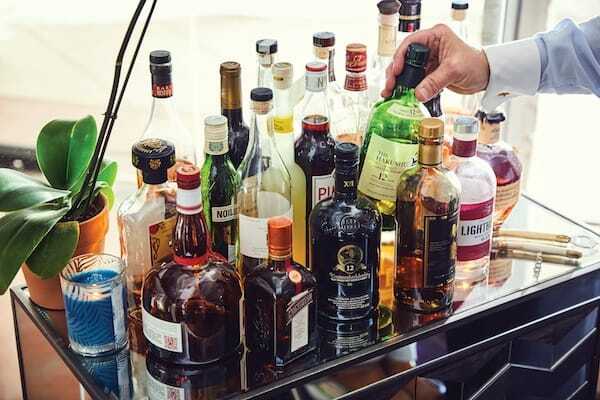 Barry Nadeau’s regulars might find their favorite elixir stocked on the drinks trolley after a few visits. He turned me around and at last I was faced with the mirror. My familiar side-swept-bang style had been transformed into Nadeau’s own unique vision: a bit shorter, with new angles and lots of bounce. The star treatment was lovely, but the reason to walk into brush in the first place — the haircut — turned out to be excellent. The old and new of Barry Nadeau’s trade. And for the first time, I understood what movement means in a haircut. My coarse, straight hair now has a life of its own and an energy of its own, and salon styling I can replicate myself. Before I left, Nadeau told me the best gratuity he could receive from a client is for them to return for another appointment. OK then, see you in three months, Barry.